April is napowrimo! national poetry month and i have taken on the challenge with other writers from around the world to write a poem a day for the month of April.i give thanks and praise for the Grenada Writers Association for sharing and encouraging! To those who have been bugging me for a peek over the first two weeks here are a few! What if he wrote long emails softening to her inner self? What if he put down his blackberry and chose love over text? What if he looked deep into her eyes and actually said something? or a Sufi love poem? cars parked with windows rolled? What if he too was longing for more? is what he longed to escape? because all they can see is the pants. The urge to write this blog began last November when my friend and fellow co- peace educator, Thomas and I were invited to join an evening session with New Leaf’s support group for men. 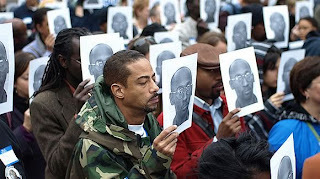 The next incentive leading to this blog is the powerful solidarity image of Troy Davis above. Perhaps it has taken awhile for this blog to unfold as I try and figure out the connection between the photo in honour of Troy Davis and the transformative experience of sitting in group with men who are helping one another to heal. For years I understood how, and to a certain extent, why our patriarchal world system denies women and girls throughout the globe the freedom to discover and exercise their natural powers and human rights; a world system that favours masculine over feminine, reason over emotions, right over left, profits over people, concrete over earth. However, it is only recently I began to understand more clearly how the patriarchal system has done great damage to our men world- wide. I began to understand how many men (not all) have lost their natural abilities to walk hand in hand with their feminine side, with their mothers, grandmothers, sisters, daughters, and wives; how many men have lost their natural abilities to feel and express their feelings, emotions; lost their ability to honour and discover their vulnerable soft sides and the courage to share this not only with women but with men as well. Because of this buried, lost, denied side of themselves (and ourselves) violence perpetuates our world, humans and non- humans sadly are greatly affected. New Leaf is a community based, non-profit support group for men based in Pictou County, Nova Scotia. Majority of men who come to New Leaf have abused their wives, girlfriends, and on a few occasions their children, sometimes with horrific violence. Most of the men are ordered by the courts as part of probationary or jail release conditions, others are referred to by children’s aid, doctors, or social agencies, while a few men attend voluntarily. New Leaf uses education, role-playing, group discussion, and self-reflection as a means of helping men heal themselves. New Leaf provides men opportunities to take responsibility and stand accountable for the violence in their lives and work to change this. Along with group sessions New Leaf provides individual counselling to youths and visits schools in conjunction with a women’s shelter outreach program. The program is funded by the department of community services on a year to year basis and by community donations. New Leaf sees about 250 men and 50 teens a year. It is difficult to understand how this program struggles with funding cutbacks yearly, but then again maybe it is not difficult to understand when witnessing, throughout Canada today, continuous government cutbacks in community and social services. Over the past weeks I contemplated the image of Troy Davis and in particular why this photo kept reminding me to write the blog in honour of New Leaf, even though, the image I felt, was a reflection of something entirely different. I soon realized it had everything to do with New Leaf, this blog, and the racist patriarchal system that put Troy Davis to death in the first place. Troy Davis was a black man accused of killing a police officer in the States and who was put to death in September 2011. Before the State killed him 7 out of the 9 witnesses proclaimed Troy Davis’ innocence. The State killed him still. A group of different race people sitting in solidarity, holding a photo of Troy Davis in front of their own faces spoke volumes to me. For me it says we are one another. I am you and you are me and we are in this fucked up world together. I could not help think, if I was born male under this world patriarchal system, within a cycle of personal and social violence then perhaps I too would be the one holding the cutlass or hammer or fist that killed my love, my girlfriend, my wife. It said to me that there is a fine line between all of us, between those who act out in violence and those who do not. That there is a fine line between how people come to know their violence, how people take accountability for their violence, and how this fine line can be determined by race, ethnicity, culture, class, personal histories, and patriarchal systems that deny and kill people’s stories. I oppose the death penalty not just because it kills many innocent people like Troy Davis but because it kills people’s stories too. As a writer, womyn, youth, and social activist i am interested in where violence comes from. I am interested in the layers of people’s stories. I am and was moved by the work the men at New Leaf were and are doing, not only transforming their own attitudes and behaviours but also that of their families, communities, and society on a whole. New Leaf is a powerful example of how personal transformation leads to social transformation. I believe we the world need to find solutions, paths, spaces that help men and boys find their natural, beautiful, fearless, vulnerable selves so they can begin to see themselves, and not be threatened by, the reflections of their feminine souls. I believe we as a global community need to begin understanding one another’s stories and the layers and root causes of these stories so we can begin addressing the larger issues. So that we can begin seeing one another’s faces held up in solidarity, knowing you are me and I am you! This series of one womyn dancing her ‘do’ in the clouds will be travelling to Switzerland in a few days!